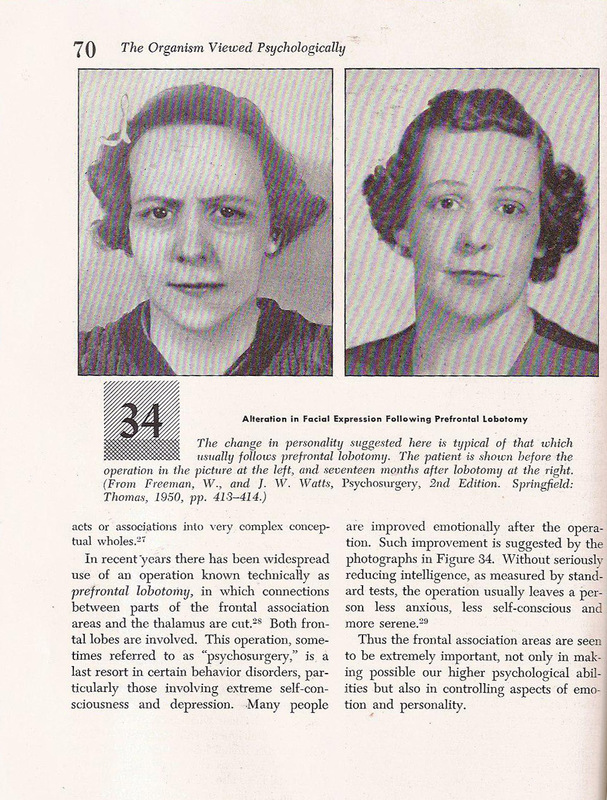 This image from a disintegrating 1951 psychology text ambushed me while I was scrounging for collage material. The before and after pics wouldn’t seem out of place in some ancient ad for a beauty treatment. I dreamt about this possibly long-dead woman last night and think I may need to paint something about her to exorcise her. I know lobotomies aren’t performed anymore, but it does make me think that with the plethora of antidepressants being prescribed to the worried well, something basic hasn’t really changed here. Is being anxious and self-conscious really so bad? It’s a basic part of who I’ve always been. And what’s so great about serenity? This entry was posted in Inspiration, questions and tagged anxiety, art, Inspiration, lobotomy, obsession, old books, psychiatry, psychology. Bookmark the permalink. I would now like to take the opportunity to advertise the use of pharmacological tranquilizers to sedate targets of sexual predation by child predatory homosexual psychiatrists who intend to molest their victim-patients. This has arbitrary effects on such things as the endocrine health of the victimized target, who is likely in such a vulnerable position in his or her undesirable circumstances that his refusal to take the FDA-approved horse tranquilizers are unrecognized by his emotionally-callous authoritarian parents. Rather than solve the problem by correcting a hell-borne hostile environment unfitting for a cockroach, just drug the child against his will, drain his strength, deprive his wish to strive for things in life, and break his will to survive. Then he’s so broken he’s less of a hassle to torture for the sexually-predatory psychiatrist, less of an opposition for his psychopathic sisters to torture in order to manipulate resources from the authoritarian and emotionally maladjusted parents, and more of liability for his parents to claim they have a feeling of importance in response to. So what if he doesn’t turn out well? He can just go kill himself. It’s not like he has a say in anything that dominates his life. He is not the proper owner of himself, his life, or his destiny. He is forever owned by those who permanently damaged his life, body, mind, and esteem. If he doesn’t take it too well, just drug him down again. He’ll either take it, die, or get locked up because he refused to take it or die. I’m not sure how to respond to your comment, Brian. It sounds like you’re coming from a place of personal pain, and I’m sorry to hear that. Best wishes for health and healing to you. I’ve collected quite a couple of those old “psycho” books, and have the book pictured above. A lot of these things must have been pseudo-science but a lot of people were kept in care appropriate to their needs, additionally another book I have has a case study “Positive Reinforcement with a Vegetative Idiot” they achieved a great deal of success in the experiment. .
Another book that lists IQ scores uses the following classifications for those with IQ’s bellow a hundred; Bright Normal, Dull Normal, Mental Defective, Borderline Deficiency, Moron (IQ 50-69), Imbecile (IQ 20-49) and Idiot (below 20). How times have changed, now since becoming politically correct we have moved psychiatric care into “care in the community” and when that’s not available we send them to prison forever? !